When Randy Moore’s Escape From Tomorrow premiered at the Sundance Film Festival in January, the story wasn’t the “what”; it was the “how.” Sure, there were some who seemed to admire the movie—the tale of a guy named Jim (Roy Abramsohn) spiraling into madness during a family vacation after he gets a call that he’s been laid off from his job—on its own surreal merits. But far more seemed intrigued by the audacity of Moore’s methods: shooting footage on the sly at Disney parks, without the express written consent of The Mouse. What a poke in the eye of a corporate giant, what with the princesses as cosplay prostitutes and EPCOT’s Spaceship Earth as the centerpiece of a sinister conspiracy! But there’s more going on here than simply mocking The Mouse. 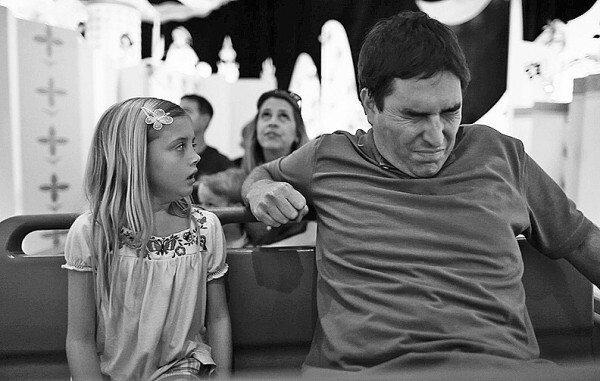 As Jim drifts from hallucinations on It’s a Small World to obsessively following a pair of teen girls around the Magic Kingdom, Moore turns the story into a study of the disconnect of a man whose sense of his masculinity is crumbling—his job lost, his wife (Elena Schuber) barely seeming to tolerate him—stuck in a place where visitors are expected to be having the most joyous time of their lives. It’s a skewering of the Disney brand in a way, sure, but it’s more a skewering of a not-quite-realized American Dream rotting the foundations of an idealized Everyfamily, USA—Blue Velvet with mouse ears. Moore drifts away from that theme later in the film, as the perspective that initially seemed to be just inside Jim’s head becomes broader, resulting in the sense that he’s taking a sprawling swipe at too many targets. While the theatrical version is much more efficient than the 15-minute-longer Sundance cut, it’s still not always focused on what it does best: turning a vacation from hell into a metaphor for our inability to deal with a reality that doesn’t match our perfect expectations.